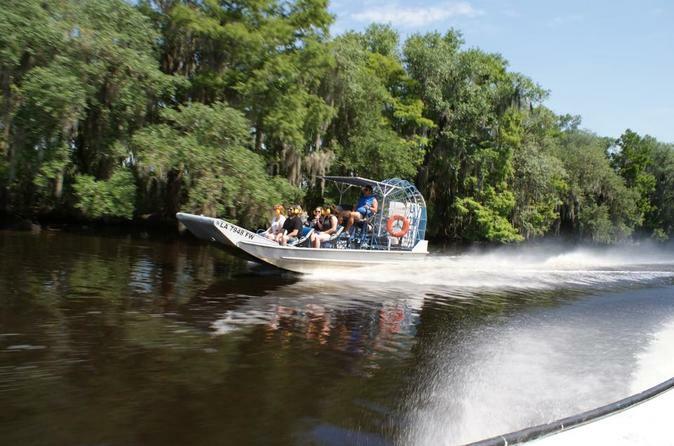 Experience the thrill of riding a 16-passenger airboat on a 2-hour New Orleans swamp tour, with informative narration provided by the captain. See alligators and other wildlife in their natural habitat during the adrenaline-fueled ride. This family-friendly tour includes the convenience of hotel transport from downtown hotels. This 2-hour swamp tour of New Orleans starts with pickup from your downtown hotel. After a 35-minute drive by air-conditioned van, you'll arrive at your destination. Meet your airboat captain and settle into your seat on the 16-passenger vessel, then prepare for a wild ride into the swamp. Powered by a 454 Chevy engine and propelled by huge fans, the airboat travels at speeds up to 25 miles per hour (40 kph). The captain performs exhilarating high-speed maneuvers, cruises at gentle speeds, and makes plenty of photo stops while narrating on the wildlife and local flora. Alligator sightings are common in these waters, but your guide is trained to ensure safety at all times during this family-friendly outing. After your tour concludes, relax with transport back to your hotel in New Orleans.